In applications involving several steps - from producing and labeling a probe to detecting the labeled probe - assessing labeling efficiency can be an essential part of assay design. The efficiency of labeling can be estimated by comparing the relative detection sensitivity of the labeled nucleic acid to a standardized sample in a side by side dot blot dilution series. Dilute both the labeled nucleic acid sample and the labeled DNA standard to 1 µg/ml, 100 ng/ml, 10 ng/ml, and 1 ng/ml in TE. Dot 1 µl of each dilution on nitrocellulose or nylon membrane. Crosslink the membrane according to the manufacturers’ protocol. Detect by incubating with the appropriate alkaline phosphatase conjugate and an AP substrate such as BCIP/NBT or DuoLuX™ Chemiluminescent/Fluorescent Substrate according to the instructions provided with the substrate. Efficiency of labeling can be estimated by the comparison of the signals of the labeled sample and the labeled DNA standard. The sample to be tested is reacted with the kit reagents along with standards containing known amounts of biotin. The absorbance readings of the known samples are plotted producing a standard curve. 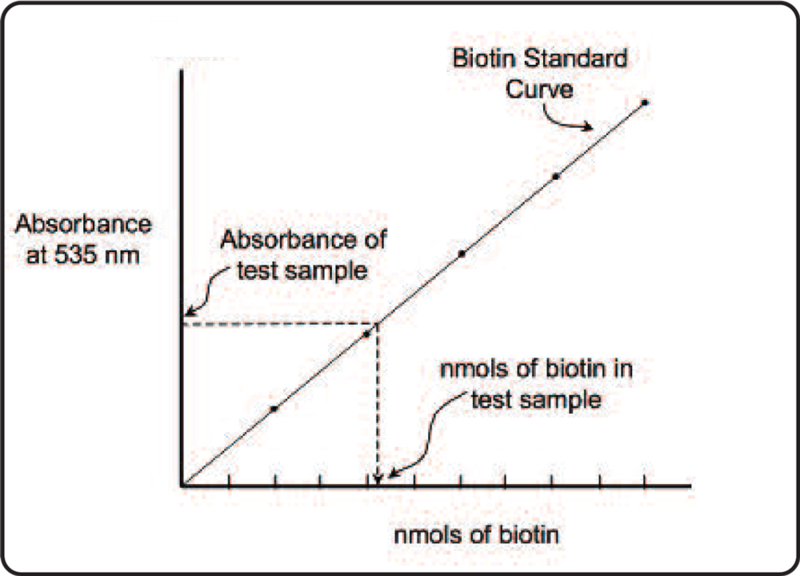 The absorbance of the test sample is located on the standard curve indicating the amount of biotin present..
For biotin-labeled probes, labeling efficiency can be determined using either the dot blot technique or an alternative method - Quant*Tag™ Biotin quantitation. The Quant*Tag™ Biotin Kit is designed to determine the amount of free biotin in solution or the number of biotins attached to nucleic acids, proteins, or other macromolecules. The kit reagents chemically react with free or bound biotin, producing a colored product that can be quantified using a spectrophotometer. The absorbance is measured in the visible spectrum, allowing the use of plastic cuvettes or microtitre plates. Unlike other methods of measuring biotin incorporation, no pre-digestion of the nucleic acid is required, saving time and increasing consistency. The assay can be completed in 30 minutes, and is able to detect less than 1 nmol of biotin. Blotting can be done onto either nylon or nitrocellulose (nylon membranes usually require a shorter exposure time than nitrocellulose and are therefore recommended, especially when using CCD camera-based digital imagers). Hybridization: Prehybridization and hybridization incubations can be carried out in appropriate hybridization tubes or in heat-sealable polyethylene bags. To ensure constant agitation, incubations can be performed in a commercial hybridization oven or water bath equipped with a shaking platform. Prehybridization: Preincubate the membrane in sufficient HYBEX™ Hybridization Solution to ensure that the membrane is completely covered (usually 0.2 ml of hybridization solution is enough for each square centimeter of membrane). Nitrocellulose membranes are prehybridized for 1-2 hours and nylon membranes for 30 minutes. Prehybridization temperature should be the same as the temperature used for hybridization. Hybridization: Double stranded DNA probes need to be denatured before hybridization. Dilute denatured probe in HYBEXTM solution. Use sufficient hybridization solution to ensure that the membrane will be completely covered. Decant prehybridization solution and immediately add diluted probe to the membrane. Optimal hybridization temperature will depend on the probe type and size and may have to be empirically determined. As a guideline, temperatures can range from 68 °C for large DNA fragments to room temperature for short oligonucleotide probes. (For oligonucleotide probes it is necessary to determine the melting temperature of the oligo). Incubate the membrane with the HYBEX™ solution containing the probe for two hours to overnight. Following hybridization, wash the membrane with stringency solutions: 2 x 5 min in 2x SSC, 0.1% SDS, followed by 2 x 15 min in 0.1x SSC, 0.1%SDS. (1x SSC is 0.15 M NaCl, 15 mM Trisodium Citrate, pH 7.0). Detection: This protocol is adapted from the UltraSNAP™ Detection Kit which has been optimized for the chemiluminescent or fluorescent detection of biotinylated nucleic acid. Solution volumes are for a 100 cm2 blot and can be scaled accordingly. A general protocol using the chromogenic alkaline phosphatase substrate, BCIP/NBT, as the substrate is described on the following page. Block blot in 20 ml of 1x PolyBlock™ Reagent for 30 minutes at room temperature with gentle shaking. Incubate the blot in diluted Alkaline PhosphataseStreptavidin (1 µg/ml in 1x PolyBlock™ Reagent) for 30 minutes at room temperature with gentle shaking.
. Wash blot 3 times for 10 minutes each in 30 ml of 1x Wash A at room temperature with gentle shaking. Remove excess Wash B by touching edge of blot to absorbent paper. Cover the blot surface with DuoLuX™ Substrate (about 5 ml). Incubate for 5 minutes under subdued light or in the dark. Wash the blot in 30 ml of 1x Wash B for 1 minute at room temperature with gentle shaking. Remove excess liquid from the blot by touching edge to absorbent paper. See Note A. Place the blot in a sheet protector or between layers of plastic wrap and smooth away any bubbles trapped between layers. The signal can be recorded with either film or a digital imager. Digital imager: For optimal exposure time, please consult the manufacturer of the digital imaging system. A digital imager also enables recording of fluorescent signal. See Notes C and D.
DuoLuX™ fluorescence signal can be achieved with a UV transilluminator. The signal can be acquired with a digital imager or conventional camera, equipped with an ethidium bromide filter. Preexposure to UV light for at least 2 minutes frequently enhances the fluorescent signal. DuoLuX™ fluorescent signal can usually be captured in just a few seconds. However, for the best picture quality some optimization may be needed. The fluorescence of the developed substrate can be recorded months after the chemiluminescence has faded. See Note D.
A. Extensive washing will reduce signal strength; do not extend the wash time unless high background is experienced. If background is excessive, repeat steps 6-9 with a wash time of 5-10 minutes in step 8. Ideal wash time is dependent on the degree of background previously detected and, therefore, may require optimization. B. The long emission lifetime of DuoLuX™ allows the user to re-expose the same blot until optimal signal to noise ratio is achieved. Typical exposure times are from 5 to 60 minutes. C. Exposure time for chemiluminescent signal development will depend on the sensitivity of the instrument. Often, imagers require longer exposure times than x-ray film. D. Prolonged exposure to UV will weaken chemiluminescent emission. If fluorescence imaging is to be performed, chemiluminescence should be recorded first. Block blot in 20 ml of 1x Casein Solution for 30 minutes at room temperature with gentle shaking. Incubate the blot in diluted Alkaline PhosphataseStreptavidin (1 µg/ml in 1x Casein Solution) for 30 minutes at room temperature with gentle shaking. Wash blot 3 times for 5 minutes each in 30 ml of TBST (Tris buffered saline, pH 7.5, with 0.1% Tween) at room temperature with gentle shaking. Rinse blot for 5 minutes in 30 ml 0.1 M Tris, pH 9.5. Prepare BCIP/NBT substrate solution according to kit instructions in a separate staining dish, and submerge the blot in the solution until signal develops. Probes other than biotin can be detected by substituting Alkaline Phosphatase-Streptavidin in step 2 with the appropriate AP-conjugated antibody. This procedure uses successive rounds of Fluorescein Avidin DCS and Biotinylated Anti-Avidin to detect and amplify in situ hybridization signals. The multiple binding capability of Biotinylated Anti-Avidin D can provide significant amplification. This antibody binds to Avidin D through the antigen binding sites and through the biotin residues that are covalently attached to the molecule. Following the first application of Fluorescein Avidin DCS, the signal is amplified by incubation with Biotinylated Anti-Avidin, followed by a second incubation with Fluorescein Avidin DCS. This results in the introduction of several more fluorochromes at the target site. The same procedure can be performed with labeled streptavidin and Biotinylated Anti-Streptavidin (see diagram on page 18). After hybridization of biotinylated DNA/ RNA probes, block tissue sections or chromosome spreads for at least 30 minutes in 1x ISH Blocking Solution*. The effectiveness of the blocking solution may be enhanced by pre-warming the solution to 37 ºC and incubating tissue sections or chromosome spreads for 30 minutes or longer at 37 ºC. Dilute each of the detection reagents (Fluorescein Avidin DCS and Biotinylated Anti-Avidin; or fluorescent streptavidin and Biotinylated Anti-Streptavidin) to 5 µg/ml in 1x ISH Blocking Solution approximately 30 minutes before use to minimize any non-specific binding. Drain off the blocking solution from the specimen and add the Fluorescein Avidin DCS solution (5 µg/ml). Incubate for 30 minutes at room temperature. Wash slides for 2 x 3 minutes in blocking solution. [If satisfactory sensitivity has been achieved, skip to step 8. To amplify the fluorescent signal, continue with steps 5 through 7]. Perform a second incubation of the sections or spreads with the same Fluorescein Avidin DCS solution (5 µg/ml) for 30 minutes at room temperature. Wash slides 2 x 5 minutes in 4x SSC + 0.1% Tween 20 before coverslipping with a VECTASHIELD® Mounting Medium. * Note: 5% nonfat dry milk plus 0.1% Tween 20 in 4x SSC can be used as an alternative blocking solution. (4x SSC is 0.6 M NaCl, 60 mM sodium citrate, pH 7.0.) However, non-fat dry milk can contain variable amounts of biotin which could reduce staining if used as a diluent for (strept)avidin conjugates. Dilute each of the detection reagents (Biotinylated Anti-Fluorescein and Fluorescein Avidin DCS) to 10 µg/ml in 1x ISH Blocking Solution for approximately 30 minutes before use to minimize any nonspecific binding. Drain off the blocking solution from the specimen and incubate with Biotinylated Anti-Fluorescein solution (10 µg/ml) for 30 minutes at room temperature. Incubate with the Fluorescein Avidin DCS solution (10 µg/ml) for 30 minutes at room temperature. After hybridization of biotin-labeled DNA/RNA probes, block tissue sections or chromosome spreads for at least 30 minutes in 1x ISH Blocking Solution. The effectiveness of the blocking solution may be enhanced by pre-warming the solution to 37 ºC and incubating tissue sections or chromosome spreads for 30 minutes or longer at 37 ºC. Please see Note A. Dilute Alkaline Phosphatase Streptavidin to 1–5 µg/ml in 1x ISH Blocking Solution approximately 30 minutes before use to minimize any non-specific binding. Please see Note B.
Visualize the probe by incubating the tissue section or chromosome spread in BCIP/NBT substrate working solution prepared according to kit instructions (BCIP/NBT Substrate Kit). Incubate until desired sensitivity is achieved. Wash in 100 mM Tris, pH 9.5 buffer for 5 minutes. Rinse in tap water and counterstain if desired (BCIP/NBT substrate is compatible with Vector® Nuclear Fast Red counterstain and Vector® Methyl Green counterstain). For permanent mounting, dehydrate, clear, and mount sections in VectaMount™ Mounting Medium which minimizes crystal formation in mounted sections. For aqueous mounting, use VectaMount™ AQ Mounting Medium. A. 5% nonfat dry milk plus 0.1% Tween 20 in 4x SSC can be used as an alternative blocking solution. (4x SSC is 0.6 M NaCl, 60 mM sodium citrate, pH 7.0.) However, non-fat dry milk can contain variable amounts of biotin which could reduce staining if used as a diluent for (strept)avidin conjugates. B. For an overnight incubation in the BCIP/NBT substrate solution, use the Alkaline Phosphatase Streptavidin reagent at a concentration of 0.3 – 0.5 µg/ml. After hybridization of fluorescein-labeled DNA/RNA probes, block tissue sections or chromosome spreads for at least 30 minutes in 1x ISH Blocking Solution. The effectiveness of the blocking solution may be enhanced by pre-warming the solution to 37 ºC and incubating tissue sections or chromosome spreads for 30 minutes or longer at 37 ºC. Please see Note A. Dilute Alkaline Phosphatase Anti-Fluorescein to 5 µg/ml in 1x blocking solution approximately 30 minutes before use to minimize any non-specific binding. Please see Note B. Drain the blocking solution from the specimen and incubate with Alkaline Phosphatase AntiFluorescein solution for 30 minutes at room temperature. Wash slides for 2 x 3 minutes in 100 mM Tris, pH 9.5 buffer. Visualize the probe by incubating the tissue section or chromosome spread in BCIP/NBT substrate working solution prepared according to kit instructions. Incubate until desired sensitivity is achieved. B. For an overnight incubation in the BCIP/NBT substrate solution, use the Alkaline Phosphatase Anti-Fluorescein reagent at a concentration of 0.2 – 2.0 µg/ml. The procedures outlined below use heat to denature the DNA without disrupting the biotin-avidin interaction. The temperature of washes and elution will depend on the length and base composition of the DNA. According to Carriero(2002), PCR amplified genomic DNA was denatured and mixed with biotinylated oligonucleotide (GA)20. This mixture was allowed to anneal and was mixed with VECTREX® Avidin D. After two washes to remove unbound DNA, a more stringent wash at 55 °C was employed. Single-stranded DNA was collected by incubating in solution at 65 °C. Kandpal (1994) heat denatured a genomic digest or PCR product and hybridized it to a biotinylated 29-base oligomer. The hybridization mixture was added to VECTREX® Avidin D that had been blocked with salmon DNA in 0.1 M Tris, pH 7.5, 150 mM NaCl. The VECTREX® Avidin D was washed in Tris/HCl to remove unbound salmon DNA. After binding at room temperature, the supernatant was removed. The matrix was washed three times with Tris/NaCl at room temperature, followed by one wash with the same buffer at 50°C. Single-stranded DNA was recovered by incubation at various stringencies. (AGAT)11 repeats were dissociated in 150 mM NaCl at 65 °C. (CAG)15 repeats were recovered in 15 mM NaCl at 65 °C, while (CA)n repeats were dissociated in water at 65 °C. Rehner (2003) annealed PCR products to biotinylated oligonucleotides specifying CA, GA, AAG, or GTT motifs. These hybrids were incubated with VECTREX® Avidin D. After washing in 0.2x SSC/0.1% SDS (1x SSC is 15 mM Citrate, 150 mM NaCl, pH 7.2) to remove unbound DNA, all were suspended in TLE (10 mM Tris, 0.1 mM EDTA, pH 8.0) and heated to 95 °C for 5 minutes to elute single strands (regardless of the biotinylated oligonucleotide used). Carrieo F, Fontanazza G, Cellini F, Giorio G. 2002. Identification of simple sequence repeats (SSRs) in olive (Olea europaia L.). Theor Appl Genet. 104:301-07. Kandpal RP, Kandpal G, and Weissman SM. 1994. Construction of libraries enriched for sequence repeats and jumping clones, and hybridization selection for region-specific markers. PNAS. 91:88-92. Rehner SA and Buckley EP. 2003. Isolation and characterization of microsatellite loci from the entomopathogenic fungus Beauferia bassiana (Ascomycota: Hypocreales). Mol Ecol Notes. 3:409-11. There are many methods used to purify nucleic acid samples at different steps in sample preparation (isolation, labeling, etc.). Which is the best suited will depend on the nature of the sample (DNA, RNA, oligos), the nature of the contaminant (proteins, nucleotides, reactive chemicals) or the desired level of purity. The simple protocols below can be used for preparation of the samples used in protocols on pages 19-26. Ethanol precipitation is a commonly used method to precipitate nucleic acids out of solution due to their low solubility in alcohols. DNA and RNA will precipitate out, leaving soluble contaminants in the solution. Adjust sample volume to 50 µl with water or TE buffer (10 mM Tris, pH 8.0, 1 mM EDTA). Pellet the precipitated nucleic acid by centrifugation at 10,000 x g (ca. 13,000 rpm) for 15 minutes. Remove supernatant and wash the pellet with 70% ethanol. Centrifuge at 10,000 x g for 5 minutes. Remove supernatant and resuspend the pelleted nucleic acid in TE. Store at -20 °C to -80 °C for up to 1 year. Due to the difference in molecular weight, a nucleic acid sample can be separated from small contaminants such as nucleotides, unincorporated labels, small primers, etc., using gel filtration on spin columns. For this method, use a commercially available spin column or prepare a spin column with Sephadex® G-25 or other gel filtration matrix with a similar separation range (1 - 3 ml column volume). While the small molecular weight contaminants enter pores of the gel filtration media, the large molecular weight sample remains in the void volume and is easily recovered by subsequent centrifugation. Load the sample (in TEN buffer) onto the column and allow to equilibrate for 5 minutes. Centrifuge the sample (1-2 minutes at 1,000 x g) through the column into a clean tube.